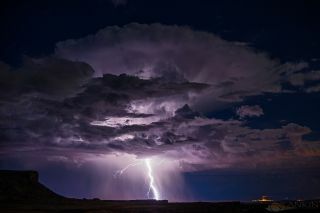 Lightning electrifies the evening sky over Utah, as an intense storm charges across southern Utah and northern Arizona. Photographer David Rankin captured this incredible scene from the southern end of Lake Powell, Utah, just after sunset on Sept. 14, 2013. Solar winds hitting Earth may trigger an increase in lightning, a new study suggests. The research finds an increase in the number of lightning strikes after the streams of plasma and particles known as solar wind arrive on Earth from the sun. Exactly why this correlation exists is unclear, but researchers say the interaction of solar particles might somehow prime the atmosphere to be more susceptible to lightning. The idea that lightning has roots in space is not a new one. In 2013, researchers found evidence that cosmic rays, which are high-energy beams of particles that likely originate in supernovas, may trigger lightning when they enter Earth's atmosphere. As they stream through the atmosphere, cosmic rays knock electrons off of atoms, potentially causing a chain reaction when those electrons knock into other atoms, dislodging even more electrons. In the 2013 study, researchers found that thunderclouds contain already-charged water droplets and ice crystals, meaning a normal level of cosmic rays could push these clouds over the edge into lightning territory. Not all researchers are convinced that cosmic rays play a role in generating lightning. But if they do, strong solar winds' magnetism should strengthen the magnetic field that surrounds Earth, Scott said in a video about the new findings. That's not what Scott and his colleagues found, however. The researchers compared a record of lightning strikes from the U.K. Met Office lightning detection program from between 2000 and 2005. They focused on strikes within a 310-mile (500 kilometers) radius of central England. They then analyzed the lightning strikes in comparison with solar wind data from NASA's Advanced Composition Explorer (ACE) spacecraft. Instead of seeing solar winds strengthening Earth's protective magnetic field, keeping cosmic rays out and preventing lightning, the researchers found the opposite. There were more lightning strikes after a significant gust of solar wind than before. After the arrival of a strong solar wind, there were an average of 422 lightning strikes in the study area over the next 40 days, compared with 321 on average in the 40 days prior. The measurements might be the result of a greater number of lightning strikes, the researchers note, or it might be that strikes are stronger and are thus picked up on weather-monitoring instruments. The lightning peaked 12 to 18 days after the solar winds arrived, researchers report today (May 14) in the journal Environmental Research Letters. "As one of these streams washes past the Earth, it brings with it a population of energetic particles that penetrate the atmosphere and appear to help modulate lightning rates," Scott said in the video. Solar winds are predictable, Scott said, so if the phenomenon proves legitimate, it might be possible to forecast times of increased lightning risk.